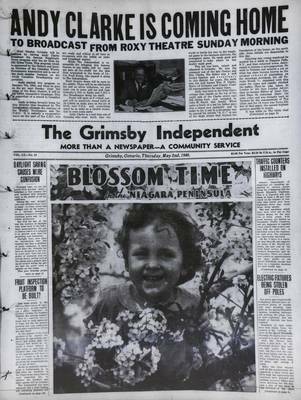 Next Sunday, Grimsby will be honored by having Andy Clarke broadcast his famous Neighborly News program over the air from his Old Home Town. This program which is sponsored by the Ontario and Quebec Division of the Canadian Weekly Newspapers Association and is one of the most popular features on the whole Canadian Broadcasting Corporation. Andy started this program on January 7, 1940, and when he goes on the air next Sunday from the stage of the Roxy Theatre, it will be his 320th consecutive broadcast...This lad was born, raised and educated in Grimsby. He was the younget son of the late George and Mrs. Clarke. His father was a well known butcher and veterinarian in this district for years. His uncle was the well known Wm. F. Clarke, Reeve of Grimsby and County Council representative for many years. Andy was born in the little frame cottage that stands on the top of the south side of the Clarke street east hill, facing west, now occupied by John W. Smith and family. When quite a broth of a lad his father gave him a brand new jackknife, and in order to try it out in a strenuous way he carved his initials "A.C." in one of the large stones that formed the foundation of the house, on the north side. Those initials are discernible to this day. Entering into young manhood he worked for a while in Niagara Falls, N.Y., and then returned home, determined to become a newspaperman. He went to Toronto and secured a job on what has since become known as the greatest school of journalism on the American continent, the old Toronto World. He remained with this paper for years and rapidly climbed the ladder. Then he was taken to London by the then London Advertiser to become Editor of their District Page. He remained there for some years and was brought back to Toronto by the management of The Globe, and for 13 years was News Editor of that paper, the second highest position possible to attain. It was while on The Globe that he made his first news broadcast, and thus became the first man in Canada to regularly broadcast the news of the day direct from a newspaper news room. His evening greeting of "Good Evening Friends" became famous half-way around the world. Shortly before the amalgamation of The Globe and Mail and Empire, which became the Globe and Mail, Andy left the newspaper field to do private work but drifted back to the game in the form of his present broadcasting program for the weekly papers. So you see folks, it is quite appropriate for this famous son of a famous town to return to his native heath at this beauteous blossom season to make his weekly broadcast to his thousands and thousands of eager listeners throughout this country. Andy has always been proud of his birthplace and we can unhesitatingly say that his birthplace is proud of him. Let us prove it in a tangible way next Sunday by packing the Roxy theatre until the walls bulge. Accompanying Andy to Grimsby will be Mr. Reid Forsee, Chief of the Talks Production Department of C.B.L. and R.K. Anderson, Supervisor of Remote Broadcasts. The party will spend the weekend at The Village Inn.